Could we possibly do any more church stuff? 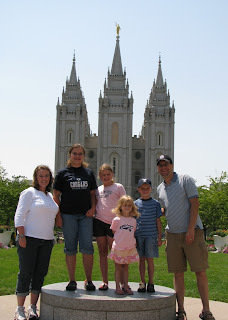 Saturday was our day to see some of the sites on Temple Square. 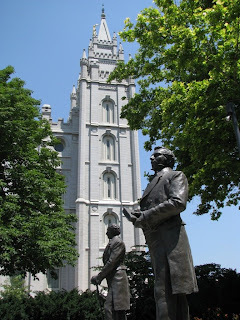 We got the tour of the North Visitors Center, had lunch at the "Nauvoo Cafe", checked out the Joseph Smith Memorial building and watched the new movie "Joseph Smith:Prophet of the Restoration" which was really good. Here Brad & I are 15 years later after our picture was first taken here at our wedding. We checked out the view from the administration building. 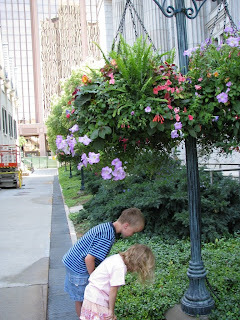 It was in the high 90's again today, so the kids were cooling off under these plants that had recently been watered and were dripping. I have to say it was very different not having Crossroads Plaza and the ZCMI center there to go shopping or grab a bite to eat. It is such a construction mess down there right now! 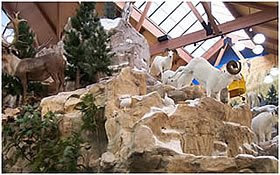 we ended up staying at Cabela's for 2 hours! It was great entertainment! All the taxidermy displays, aquariums, shooting range and candy store kept us busy. 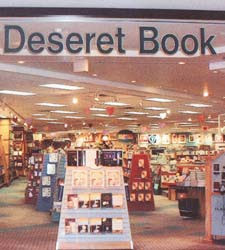 I can't imagine how long a person could spend in there who was actually interested in the merchandise! 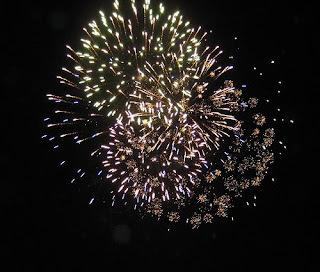 Later that night we were treated to a fireworks show being set off right behind the hotel. We still don't know the occasion, but they lasted a good 15 min. and we had the best seat in the house on our cushy deck chairs behind the hotel about 72 degrees. It was perfect!! you guys sure packed it in while you were there! It all sounds like so much fun. What and awesome day! 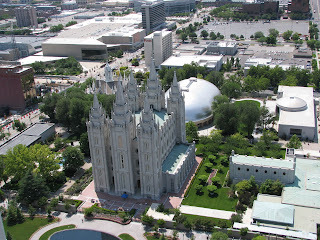 It was fun to see your picture of Temple Square from above, all the changes. Very cool.